With Singapore's growing and ageing population, our healthcare needs are expected to rise significantly in the coming years. By 2030, close to one million Singapore residents will be above the age of 65. We will therefore need to expand public healthcare services and build a strong core of healthcare professionals, to continue to provide quality and affordable care for all Singaporeans. As we invest in hardware by building new hospitals and adding more beds and services, we will continue to invest in our people and attract and retain talent, who will be the driving force for our healthcare system of the future. 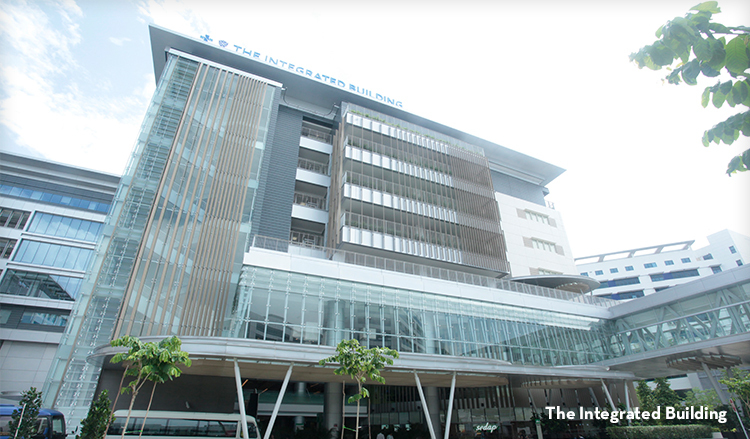 The Integrated Building (The IB) is a first-of-its-kind healthcare facility in Singapore where two healthcare institutions co-exist in the same facility, using shared resources to collaborate and transform recovery and rehabilitation for acute and community hospital patients suffering from injury, illness or surgery. Located along Simei Street 3 between Changi General Hospital and St. Andrew's Community Hospital, this is a collaboration between CGH and SACH, both foundation partners in the Eastern Health Alliance (the regional health system for eastern Singapore). With Singapore's fast aging population, integrated evidenced based care plans that optimise rehabilitation are crucial to help patients recover medically and functionally as quickly as possible. Supporting 9 inpatient wards, the IB features a comprehensive range of diagnostic and rehabilitative facilities with an emphasis on a home-like environment to facilitate transition to the community and independent living. The new model of care at The IB enables patients and their caregivers to be active participants in the rehabilitative process to prepare them for their eventual transition back to home and the community. The Groundbreaking for The IB was on 10 November 2012. The IB began receiving its first patients at its Specialist Clinics and Day Rehabilitation facilities on 15 December 2014, with the wards receiving their first patients on 18 December 2014. Facilities in The IB were opened progressively to enable new care models to be fine-tuned and ensure patient safety. If you aspire to make a difference in Singapore's public healthcare sector, Healthcare Scholarship applications are now open! Apply TODAY! Learn how JHS transforms care processes to better serve the healthcare needs in the west!